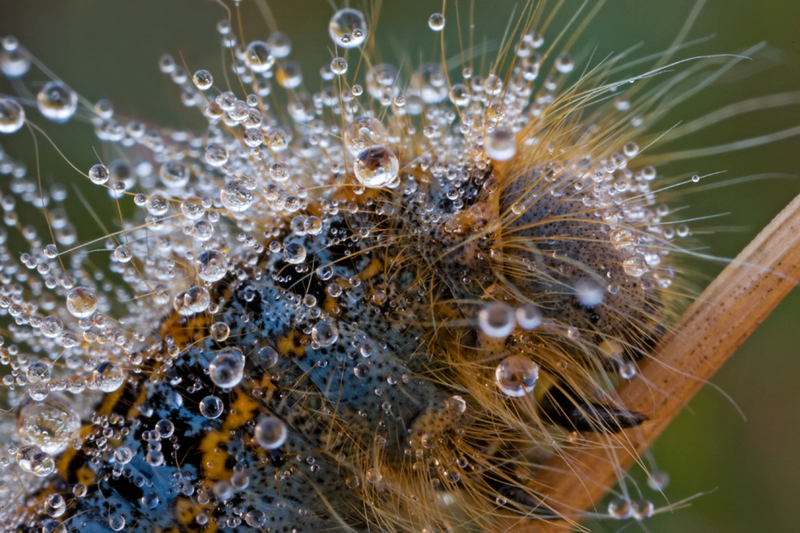 Extreme close up of a caterpillar (Malacosoma castrensis) with dewdrops, taken in the early morning after a cold night in the Veluwe nature area. The picture was taken with the MP-E 65 from Canon, that allows a magnification from 1 to 5 times lifesize. It is a difficult lens to work with, because a tiny bit of wind will already ruin your picture. Still I really love the creative possibilities it provides and I intend to use it more often this summer. MP-E 65 should be a incredible objective, I have never used it but it must be hard to use. Your picture is wonderful, I really like it. Theo, what combination of tripod and head do you use when you are working with 65 MP-E? Thanks Adolfo and Kjetil. I used a Gitzo 1348 tripod with Gitzo 1278 ballhead and Novoflex focusing rail for this picture. But the Gitzo ballhead was not good with heavy weights, so I changed to a Arca Swiss Z1 balhead some time ago, which is much steadier. Heel gaaf Theo. Prachtig detail, krachtige lens, geweldig oog. Thank you for the information Theo! Impressive image!! The drops, the contrasts, the colours, the animal... perfect! !